There is some evidence that ginger may suppress the chemicals in the body that are involved in inflammation. Studies have suggested that it can help reduce joint pain both in osteoarthritis and inflammatory arthritis but more research on how much needs to consumed for it to be effective and for how long is needed . Ginger is also an effective anti-nausea treatment, which is handy if your medication has left you feeling a bit icky. If you want to try ginger for joint pain, you'll want to consume at least 1 gram a day. 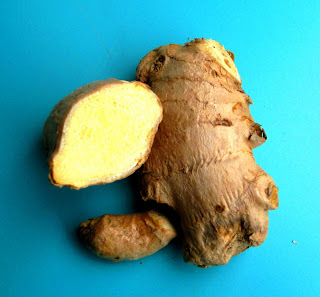 Ginger is easy to use in either powdered or fresh root form. They have slightly different tastes, the dried powder is quite intense and spicy whilst the fresh root is zingy and refreshing. Try fresh ginger grated on apple, pineapple or melon for a lively desert. A piece of fresh root ginger with boiling water poured over also makes a lovely ginger tea. 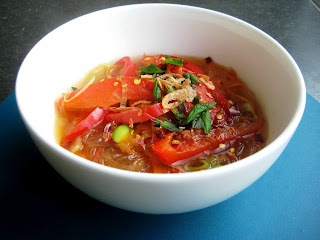 In savoury dishes, throw it into curries, stir fries and soups for a subtle warm kick. 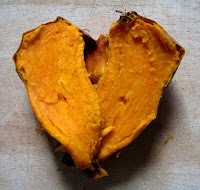 With Valentine's Day tomorrow, here are a few suggestions of some arthritis-friendly recipes. All these dishes are quick and easy to make but impressive, so you can rustle up a beautiful romantic dinner without feeling frazzled. Sometimes I really, really want pizza. But, I hate the frozen kind and when it is snowing outside trotting off to the nearest pizzeria isn't an appealing option. I could make the pizza dough from scratch, but I've got my arthritis wrist splints on and I want pizza quick. So, what's a girl to do? Make polenta pan pizza of course! This is my favourite combination of red onion, rosemary and zucchini but pretty much anything goes so feel free to use your favourite toppings. Pour the boiling stock into a saucepan and whisk in the polenta over a low heat. Keep stirring briskly for about 3 minutes or until it is thickened. Grease a medium frying pan or skillet with the olive oil and then our the polenta mixture in and smooth out with a spoon until it is even. 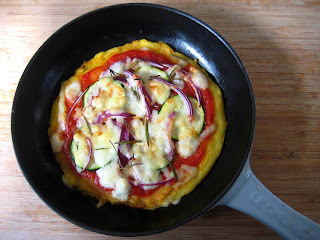 Top the polenta base with the tomato sauce, onion, zucchini, cheese and rosemary. Put the prepared pizza into the oven and bake for 20 minutes or until the cheese is molten and bubbling. Remove from oven an drizzle with extra olive oil. Allow to stand for 5 minutes - this helps the polenta base firm up enough to cut. Slice and serve. Polenta is a great gluten-free alternative to a traditional pizza base made with wheat flour. It has a light, creamy taste and soft texture. 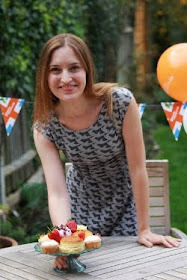 It is however quite bland on it's own so benefits from being dressed up like in this recipe. People with inflammatory arthritis (like rheumatoid, psoriatic or ankylosing spondylitis) sometimes also suffer from coeliac disease - another autoimmune condition where sufferers cannot tolerate gluten found in rye, wheat and barley. This is different to a wheat intolerance and can cause symptoms ranging from weight loss, diarrhea, through to joint pains and mouth ulcers. It is typically diagnosed through a blood test or bowel biopsy. If you'd like to find out more, try the NHS Choices site . 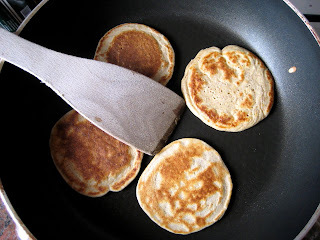 There are several gluten and wheat-free recipes on this blog. Tangy, fresh and exotic tasting - pineapple is the flavour of holiday in a bowl. It's also a great fruit for arthritis. Pineapple is a rich source of vitamin C and a good source of fibre. It also contains an enzyme known as bromelain. Bromelain helps breakdown protein and explains why pineapple juice has traditionally been used to tenderise meat (like in teriyaki marinade). Moreover, it has some interesting anti-inflammatory properties: several studies show that in doses between about 560-1980mg a day, bromelain is effective in reducing pain in osteoarthritis. Some trials have shown it to be as effective as traditional NSAIDs like diclofenac or ibruprofen. There is also some early evidence to suggest it could help relieve pain in rheumatoid arthritis but I'm not sure there is quite enough data to draw any conclusions yet. The doses used in the studies are far beyond what you would get in a portion of pineapple - if you are interested in using bromelain for pain relief you might be better off trying a supplement. Nonetheless, a bowl of pineapple is certainly more likely to help than harm arthur. Pineapple can help mouth ulcers, so if your disease modifying drugs like methotrexate leave you with sore patches, it might be worth a try. 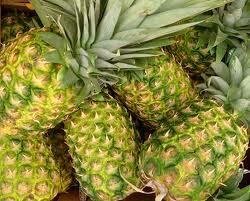 Serve fresh pineapple sprinkled with a little chilli or ginger for an added anti-inflammatory boost. For a healthy pina-colada inspired desert, grill slices until just beginning to go golden on each side and then dish up with a squeeze of lime and dusting of coconut.